The wedding season, that is. And not just because of the RW – which was fabulous all the way – but because it’s spring, and summer will come, and everyone wants the perfect weather for their perfect day so therefore it’s wedding season. Choosing an engagement ring will be closely followed by choosing a date, and then the venue and then the guests, and all along the bride is thinking about her wedding dress, more than anything else. And last of all the wedding rings will be thought about because, for some reason, it seems that the dress and the venue far outshine the wedding ring in the importance rankings. Interesting when you consider that the dress and venue are for one day, the ring is forever and will be worn every single day till death do us part. 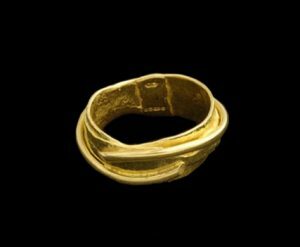 I know, that’s not really how it works much any more, but in the perfect, old fashioned scenario, that is how it works, and we’re in the old fashioned business – yellow gold rings. When Polly and I first started the business in 2007, Polly had been away from the bench for 30 years, so we had some catching up to do on what people like. We didn’t pay it much attention, really, because we both love 22ct gold and we thought everyone did, just as they used to. But no, we were wrong, and it took a few years to figure out that a) we were wrong and b) we couldn’t do anything to change it! Where we got it so wrong is that in the 30 years since Polly was at college and making her first pieces, white gold and all its derivatives have really taken hold, and this is what the young all seem to want, and not the beautiful, classic, warm yellow gold that wedding rings used to be made from, either 18ct or 22ct. Indeed many youngsters (well, 30+ is still young and I include them) don’t recognise it for what it is, and have asked Polly when she’s exhibiting at Goldsmiths’ what her metal is. True story. 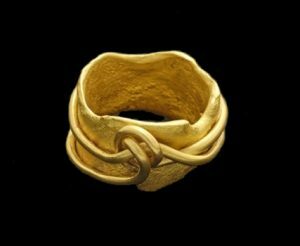 For those who do know what it is the argument against it is usually twofold; a) it’s much too soft for a ring and b) it’s much too expensive. Well, I’ve worn my wedding ring almost everyday for 42 years and it’s hardly changed, so soft is obviously not a problem but an oft repeated piece of fake news. Too expensive doesn’t really cut it either because my bet is that every single wedding dress costs twice the price of a wedding ring, and often more than twice. The ring might be a lot of money, but it’s not expensive if it does what it’s meant to do and stay on your finger happily ever after. We tried – we really tried, to convert the would-be brides by advertising in wedding magazines, in local wedding planner brochures, wedding supplements etc, but to no avail; not one single bite. All the young brides seemed to want was diamonds and white gold – the complete opposite of what we do. But that’s not to say we have never sold a 22ct gold wedding ring, we have; the clients who buy them are absolutely your not-on-the-high-street kind of brides; they’ll probably wear their mother’s wedding dress, have the reception in someone’s garden in a marquee, have friends in the catering business and the flower business, and just generally do the whole thing differently, and the ring will be the priority, not the afterthought. . So now Polly and I both wear our 22ct gold wedding rings as do some of our clients, every single day, and we’ve stopped advertising in wedding publications and trying to change the world. 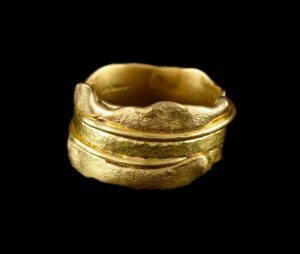 And we’re in very good company too; while the Duchesses might not have chosen Welsh gold for themselves, they will never not like their warm, organic, somehow comforting, yellow gold rings.